Foraminifera are separated into two groups following their life strategy, namely the planktonic and the benthic foraminifera. Planktonic foraminifera occur worldwide over broad laditudinal and temperature belts. They typically float in the surface or near-surface waters of the open ocean. 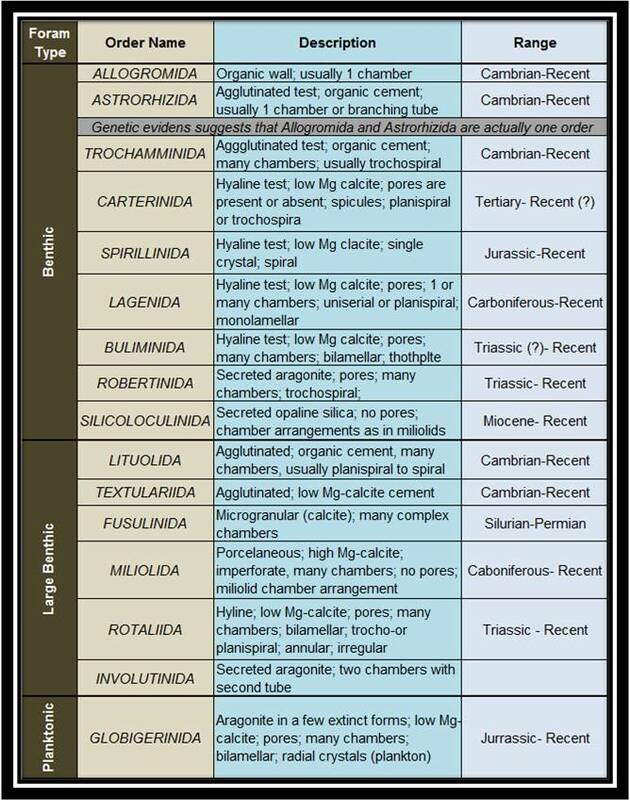 Their wide geographical range, combined with a short vertical stratigraphic time range (due to rapid evolution), make them excellent index fossils at family, generic and species levels. The figure on the left shows the ecological distribution of larger benthic foraminifera and key smaller benthic and planktonic foraminifera through space and time. Benthic foraminifera live at all depths of the ocean, or in brackish/freshwater habitats, as either free-floating or attached organisms. The so-called "larger benthic foraminifera" are a critical group of forams with complicated internal structures, which makes them unique. They aren't necessarily bigger than small benthic foraminifera, but they usually are. Larger benthic forams must be studied in thin section while smaller forams can be identified from their external morphology. The following sub-sections will discuss the benthic and planktic foraminifera in more detail.